Recently I was involved in setting up a Social Sign-in Authentication Scheme, so despite the doom & gloom of this post, we are breaking some interesting rock. I say 'involved', since I had the support of one of the nerdiest nerds in Perth, for all the server tinkering. I just had to paste in some URLs and other config settings within APEX. He expected every error, and it always seemed just due process to the finish line. We had it all sorted within a couple of hours, and I was really doing other things while they configured SSL & wallets. I can't really divulge all the details, since, you know, security, but I can certainly help describe the steps, to maybe help future tinkerers. This post from Ciprian Iancu was a major reference for the team, though it wasn't entirely accurate for us. Details below. We also moved so quickly, I didn't have a chance to copy all the errors. Our new Tomcat server needed to be running with SSL before Azure would accept a handshake. <handwave>A wallet was configured on the database server. There is talk about ensuring the one wallet contains numerous certificates, since we now need it for a number of exchanges. I entered the wallet's file location in the Internal workspace under Manage Instance -> Instance Settings -> Wallet. Without it, we get a warning regarding certificate failure. At one point the permissions on the wallet file were wrong, which I saw by opening the login page in debug mode, then checking the debug log. ACLs allow the database to communicate to certain hosts in the outside world. Ciprian's blog was helpful, but the ACLs weren't quite right. The ACL API has changed in 18c, the graph host was incorrect, and we only needed http, not connect. It took a little while to know this is where we needed to define something prior to creating the authentication scheme, as noted in this bug description. Without it, we are unable to define the authentication scheme. <handwave> Mr Sysadmin set up a Client Secret somehow in server land. I then pasted the long string under Application Builder -> Workspace Utilities -> Web Credentials. 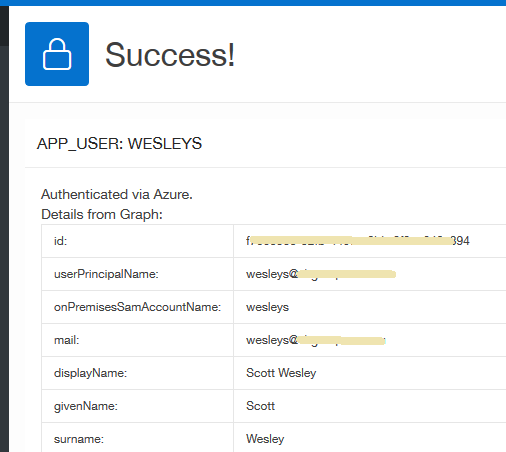 I always find some strange satisfaction in setting up an authentication scheme, and to do one that integrates with Azure using contemporary methods was particularly gratifying. 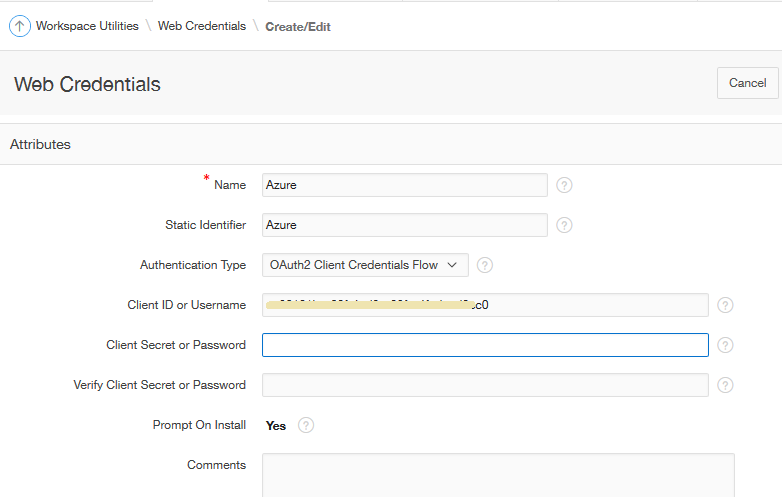 I found an OTN post from Christian Neumueller describing exactly how to apply the apex_json package to get attributes listed in the settings - I just made some adjustments to make it look a little prettier, and add the fields we wanted to look at. I'd really love to see examples like this in the inline help for attributes more often. I had a simple region on the home page to display the data. 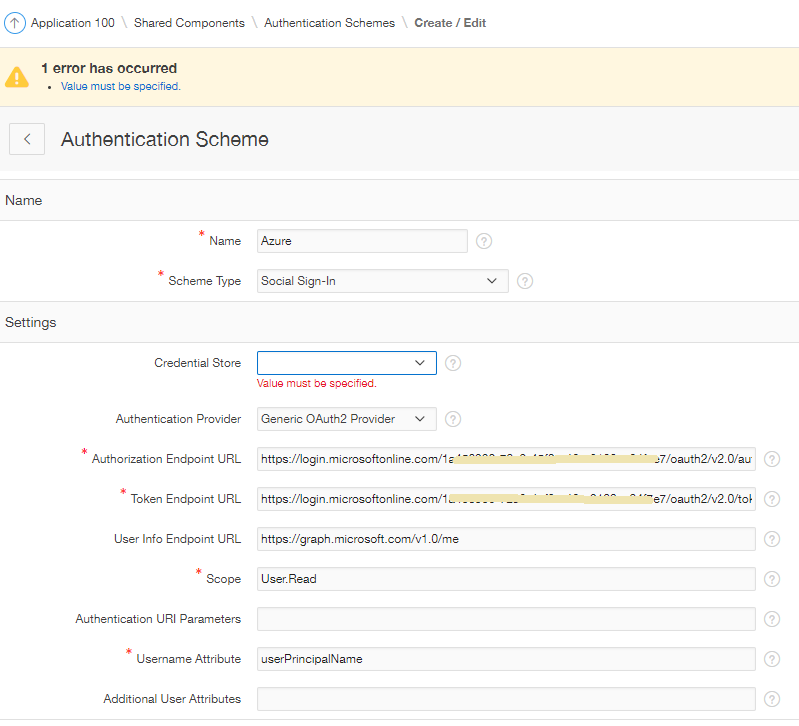 Then when we launch the application, we're redirected to login.microsoftonline.com; enter our Azure credentials, accompanied with the client's splash; then see our APEX page. We were prompted to stay signed in, but I keep pressing No until we have a chance to experiment further. 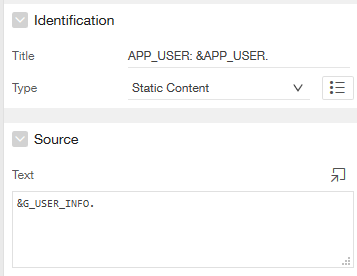 APEX uses the Username Attribute to source the APP_USER variable. In our case the userPrincipalName returned an email address, but we wanted to match this up to our existing login IDs which use the WESLEYS style format. We first tried using the onPremisesSamAccountName attribute, but that returned "wesleys"
And in 19.1, there's already a declarative "Convert Username to Uppercase" attribute. This was originally pointing to the application home page, which just re-authenticated me - which was quite handy as I refined the handling and temporary display of attributes from JSON. We still need to experiment with authentication behaviours when it comes to remembering who you are, and logging out. For now, I know we can go to portal.office.com to log out of Azure. No doubt there are other experiences & behaviours to refine as we move forward, but this is a nice step away from database accounts! This experiment was done on a fresh application, but I was able to use the principles behind sharing application authentication, to then create a button that linked to our main application - already authenticated. I hear there is now a way to programmatically change the current authentication scheme, via a parameter. I'd like to experiment with that to see how it might change my answer when people ask if we can authenticate into the one application using two authentication schemes. We had this hooked up within 2-3 hours. That can't be a normal experience, but it's still been a really good exercise in understanding how this technology works. Kind of. It's also pretty cool that we have such declarative options for setting this up in our APEX applications. Great write up Scott! Thanks for sharing this with the community. Ahh, thanks Morten. I thought I had seen you post something about Social Sign-on and switching.